WASHINGTON, DC, July 11, 2012 (ENS) – The Peruvian government must immediately halt violent repression of mining protesters, more than 80 environmental and human rights organizations demanded today in a statement that will be delivered to Peruvian embassies and consulates across the United States and Canada. Protests against Peru’s biggest mining project have been brutally put down in June and July in incidents that have left five people dead, including a 17-year-old boy, and dozens of others injured. The Peruvian government declared a State of Emergency in the region on July 3, suspending the right of assembly and causing fears of additional violence that proved to be justified. 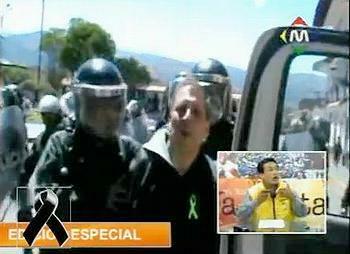 On July 4, the day after the State of Emergency was imposed, Marco Arana, a former Catholic priest and a coordinator of opposition to the Conga mine, was pulled by police from a public bench during a silent vigil in the provincial capital of Cajamarca. He was beaten while in custody, suffering internal bleeding, a broken jaw, and other head injuries before his release July 5. The signatories called on the Peruvian government to immediately put an end to these abuses, and to seek peaceful and dialogue-based resolution to conflicts related to the Conga mine and other mining and energy projects in Peru. Signatories include Amazon Watch, Earthworks, Earthjustice, Friends of the Earth, MiningWatch Canada, Oxfam America, Rainforest Action Network and the United Steelworkers. The police have repeatedly denied having committed any kind of abuse against detainees. 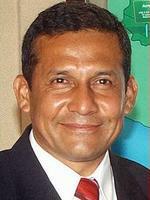 Today, Peruvian President Ollanta Humala called on the Catholic Church to mediate the conflict over the Conga project. Regional president Gregorio Santos, who has opposed the Conga mine, accepted the proposal. The Conga project involves surface mining of a large copper porphyry deposit also containing gold located 24 kilometers northeast of the Yanacocha Gold Mine, also a joint venture between Newmont and Buenaventura. “The reservoirs will supply water to downstream users who currently only have water flowing during the rainy season,” the company said. Following this announcement, President Humala expressed his strong support for the stalled Conga project. But Humala, a former military officer who values the mine for the jobs and tax revenues it will create, has said nothing about the violence this week, while his cabinet ministers suspended freedom of assembly and opposition lawmakers demanded that police restrain their attacks. Following a three year, public process on the Conga project’s Environmental Impact Assessment and reviews by 12 Peruvian government agencies, the EIA was approved by the Mines and Energy Ministry in October 2010. 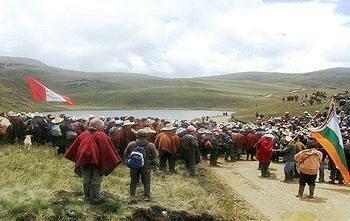 Amidst protests from anti-mining activists in late 2011, Newmont suspended construction on the project. 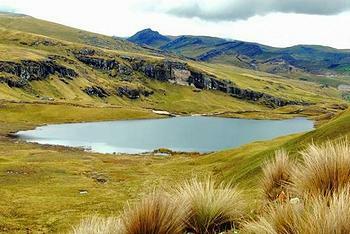 Humala appointed a three-member panel to review the EIA, which confirmed in its April report that the mining plan “meets all the technical requirements for its approval” under Peruvian and international standards. The proposed destruction of the lakes is “motivating the rejection by society,” the panel warned in its report. evaluate the possibility of relocating the Perol pit waste dump to try to avoid impacting Azul and Chica lakes. If it is not technically and economically feasible to do so, implement an appropriate hydrological and environmental compensation plan. consider encapsulating the rejects of the acid water treatment plant in a secure deposit, and improve water availability through regulation of reservoirs. consider the possibility of using acid water treatment and refinement techniques through passive methods such as wetlands with reeds planting. study the suitability to expand the reservoirs’ capacity to optimize the management of the water emanating from the project area. optimize the preservation conditions of organic soils coming from waste on the storage deposits planned and adequately preserve humic materials from the dismantling of the Perol bog for later use. Newmont has agreed to “progressively implement” these recommendations, but has not yet agreed to keep the Azul and Chica lakes intact. “Once completed, the reservoirs will increase the water storage capacity proposed in Conga’s original development plan, significantly increase the current capacity of the lakes in question and provide year-round availability of water to downstream users, something they don’t currently have as a result of the dry season,” the company says on its website. 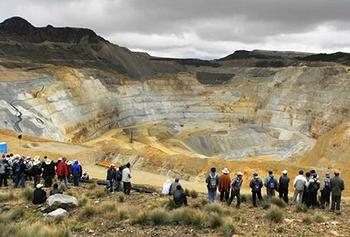 “We share President Humala’s appeal for dialogue,” the Newmont executive said. But instead of open dialogue, there is further evidence of Peruvian government censorship of mining critics. Earlier this month, a group of Peruvian filmmakers denounced government censorship of films that told of issues related to mining conflicts. “We criticize the members of the Government to provide for these purposes, dabbling in censorship practices or policies, making decisions that violate human rights and threaten basic rules of democracy,” they said in a statement. The document states that the Ministry of Agriculture invited a group of filmmakers and documentarians to show their work on the series “Water: a heritage that circulated from hand to hand.” However, six films were not shown because they had “images, sounds or texts on environmental pollution generated by mining or oil companies,” the filmmakers said. The six films had all received national and international awards.